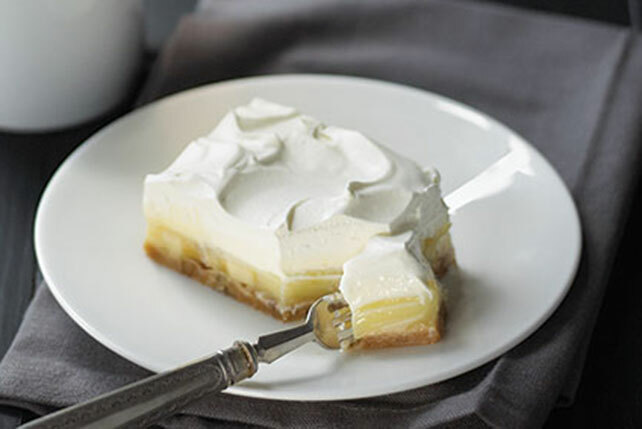 Vanilla pudding, banana slices and crushed cookies form the layers of lusciousness in this crowd-pleasing cream pie. Mix wafer crumbs, nuts and butter in 13x9-inch baking dish; press onto bottom of dish. Bake 8 min. Cool 10 min. Top with bananas. Beat pudding mixes and milk with whisk 2 min. ; spread 2 cups pudding over bananas. Stir 1 cup COOL WHIP into remaining pudding; spread over pie. Top with remaining COOL WHIP. Refrigerate 3 hours. At 16 servings, these tasty bars make great treats for any party. Toasting nuts not only gives them a pleasing golden color but also intensifies their flavor and adds crunch. To easily toast nuts, spread them in a single layer in a shallow baking pan. Bake at 350°F for 8 to 10 min. or until lightly toasted, stirring occasionally.